and because I am also playing along at the CardMakers Card Challenge Corner, I made it a wedding card. I absolutely love making a watercolor background from Delicata Golden Glitz and Silvery Shimmer inks...shiny and gorgeous!!! Imagine Crafts/Tsukineko: Delicata Golden Glitz & Silvery Shimmer inks. Versafine Onyx Black. 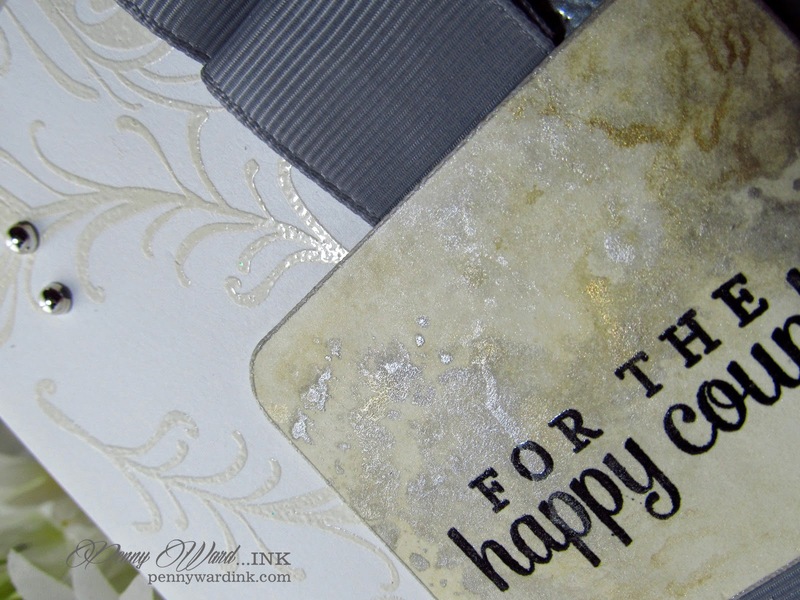 Watermark ink, White Embossing Powder. WOW - the gorgeous details you brought together to make this card are cool individually but together they make this card EXQUISITE!! Awesome and gorgeously exquisite! That ribbon is so cool and I always notice the perfect placements of pearls or enamel dots!! Yep, perfect would describe it!! Watercoloring with the Delicata inks intrigues me ... Love it! Gorgeous! Love the embossed feather in the background! And the shimmery marbled background of the sentiment panel is AMAZING! Great take on the SFYTT!